Situated just a few minutes’ walk from the beautiful River Danube, this privately run hotel enjoys a central yet quiet location in the famous World Heritage city of Regensburg. The 4-star AVIA Hotel offers brightly lit, welcoming rooms with free Wi-Fi. Wake up in the morning to a hearty breakfast buffet. The restaurant serves typically regional cuisine for lunch and dinner. On warmer days, enjoy the terrace, where you will be spoiled with tasty specialities. The AVIA Hotel is situated opposite a petrol station with small supermarket and car wash. Nearby, you will find the largest shopping centre in eastern Bavaria. 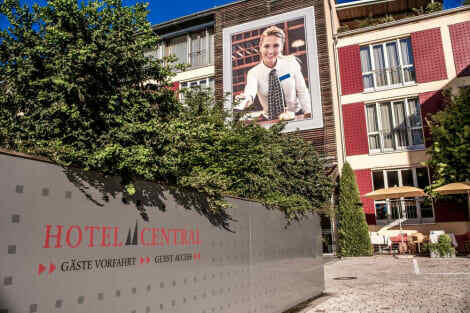 This modern, air-conditioned 4-star hotel has 159 rooms and suites with WIFI, "Esszimmer" restaurant, bar, spa, fitness center and free parking. The events area comprises 11 meeting rooms with HSIA, making it ideal for all events of up to 200 people. Park your car for free. Located in the east of the city, the hotel has excellent connections to the highway and international industrial locations. The main train station and the old town, which is 2.5 miles away, are easily accessible by public transport. Grab a bite from the snack bar/deli serving guests of Star Inn Hotel Regensburg Zentrum, by Comfort. Wrap up your day with a drink at the bar/lounge. Buffet breakfasts are available daily from 6:30 AM to 10:30 AM for a fee. Make yourself at home in one of the 114 air-conditioned rooms featuring flat-screen televisions. Complimentary wireless Internet access keeps you connected, and satellite programming is available for your entertainment. Bathrooms have showers and hair dryers. Conveniences include phones, as well as desks and irons/ironing boards. Just a 10-minute walk from the university hospital and a 3-minute drive from Regensburg University, this charming 3-star hotel offers modern rooms, an indoor swimming pool and excellent links with the A3 motorway. Free private parking is available on site. All of the Hotel Apollo's bright rooms feature a modern bathroom, free WiFi, a safe and international satellite TV. There is also a free internet terminal in the hotel lobby. The hotel also offers a meeting room and a conference room with technological equipment. A rich breakfast buffet is available each morning for an extra fee. After an eventful day in Regensburg, take a dip in the Hotel Apollo's swimming pool, enjoy the warmth of the sauna, or relax in the steam room. During summer months, the Hotel Apollo's delightful beer garden is an ideal place to have a drink. Regensburg's medival centre is a 10-minute drive away. Featured amenities include complimentary wired Internet access, a business center, and complimentary newspapers in the lobby. Planning an event in Regensburg? This hotel has facilities measuring 4306 square feet (400 square meters), including conference space. A roundtrip airport shuttle is provided for a surcharge (available on request), and self parking (subject to charges) is available onsite. Make yourself at home in one of the 77 guestrooms featuring minibars and flat-screen televisions. Complimentary wireless Internet access keeps you connected, and satellite programming is available for your entertainment. Conveniences include desks, housekeeping is provided daily, and cribs/infant beds (complimentary) can be requested. Take in the views from a terrace and make use of amenities such as tour/ticket assistance and a ballroom. 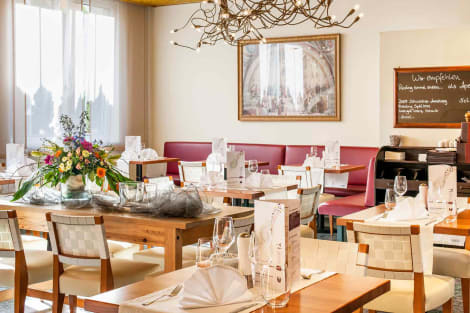 Enjoy a satisfying meal at Weltenburger am Dom serving guests of ACHAT Plaza Herzog am Dom Regensburg. Wrap up your day with a drink at the bar/lounge. Breakfast is available for a fee. This comfortable hotel is in Regensburg. The property comprises 20 cosy bedrooms. Altstadthotel am Pach is not a pet-friendly establishment. lastminute.com has a fantastic range of hotels in Regensburg, with everything from cheap hotels to luxurious five star accommodation available. We like to live up to our last minute name so remember you can book any one of our excellent Regensburg hotels up until midnight and stay the same night.